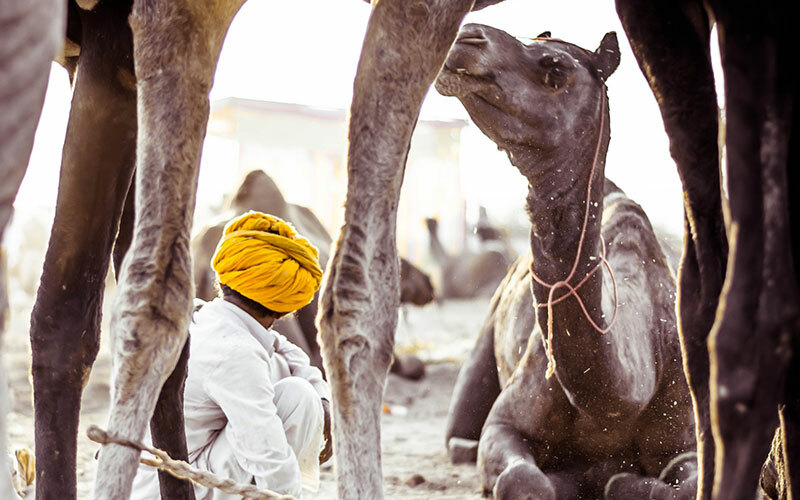 The Pushkar Fair (or the Pushkar Camel Fair) is one of the world's most famed fairs for buying and selling of livestock. 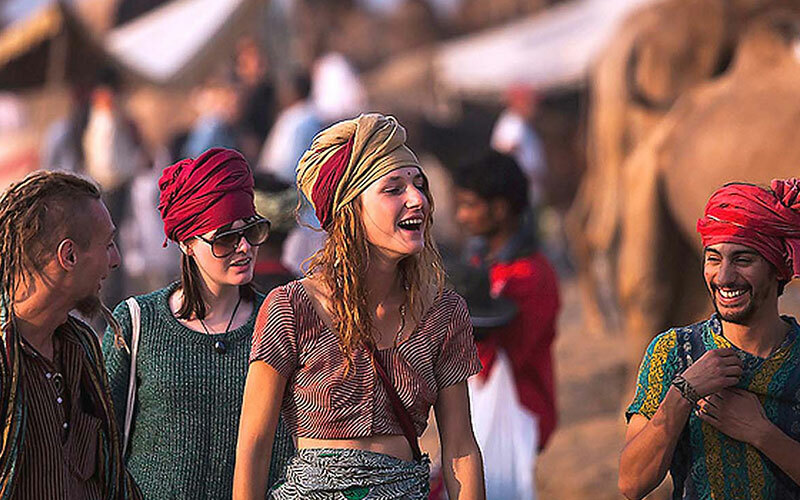 But, over the recent years, this camel fair has become a major attraction for tourists from different parts of the world. Exciting competitions like the 'Longest Moustache' and the 'Bridal Competition' are the key highlights of the Pushkar Fair in Rajasthan. Apart from the Pushkar Camel Fair, the town of Pushkar is also visited for its holy Pushkar Lake where a large number of devotees take a holy dip during the Karthik Purnima. After a full day sightseeing tour of Old and New Delhi, drive to Mandawa which is well-known for beautiful havelis belonging to the Raput rulers of the past. Next, head for Bikaner where you'll enjoy a camel safari across the Sam sand dunes and savour a wide range of delectable Rajasthani dishes. Visit Jodhpur where you'll meet with locals of the Bishnoi villages. Also, view the Mehrangarh Fort and the Jaswant Thada. Next day, drive to Pushkar, the major highlight of the tour. You'll have plenty of time to explore the tourist attractions of the town and visit the camel fair. Also, take a stroll through the local markets of Pushkar before reaching Jaipur, the 'Pink City'. Jaipur is visited for its Rajput era monuments and forts. Key places to see in the city include Amber Fort, City Palace, Hawa Mahal and Jantar Mantar (the Observatory) among others. Get ready to drive to Agra while visiting Fatehpur Sikri, known as the 'Ghost Town' en route. Witness the mind blowing beauty of the Taj Mahal and the grandeur of the Agra Fort. Get back to Delhi for departure. You will be met on arrival at Delhi international airport by Max Holidays representative, who will assist you to get transferred to pre booked hotel. Overnight at the hotel. After breakfast, take full day guided sightseeing of Old and New Delhi, visiting Red Fort built by Shah Jahan who held his first Durbar here on 18th April 1648 AD. Jama Masjid (Jumma Mosque) is the biggest mosque in India and perhaps in the whole world. Other places of interests are Lotus Temple, Birla Temple and national museum. Also visit New Delhi, Qutub Minar, Quwat ul Islam mosque and Iron Pillar. From outside see President’s house which was formerly the Governor General’s residence of colonial India. In front of President’s House is India Gate a memorial of soldiers who lost their lives in World War I and Afghan war. Humayun’s tomb built in red sandstone built by Akbar between 1565-1580 AD. Evening is at leisure to take a walk at Connaught place area. Overnight at the hotel. After early breakfast drive to Mandawa, where every stone has its own beauty and history to speak and each one is different from each other speaking its uniqueness. Mandawa is famous for havelis and its frescoes on the walls which want to say something. On arrival, you will be met by Max Holidays representative at your hotel, who will assist you while check-in at the hotel. Later take city sightseeing of Mandawa, covering some beautiful and splendid havelis. Visit Jhunjhunwala haveli, Murmuria haveli, Binsidhar Newatia haveli and Mandawa Fort. Overnight at the hotel in Mandawa. After breakfast, drive to next destination Jodhpur - popularly known as blue city as when you will look down the city from the height or from the fort corridors it will give blue view. As the sun rise are always here to lighten the city so as the tourists are always here to admire the beauty of Jodhpur. On arrival check into hotel for overnight stay. Evening is free to explore the glittering old market of Jodhpur near clock tower area. 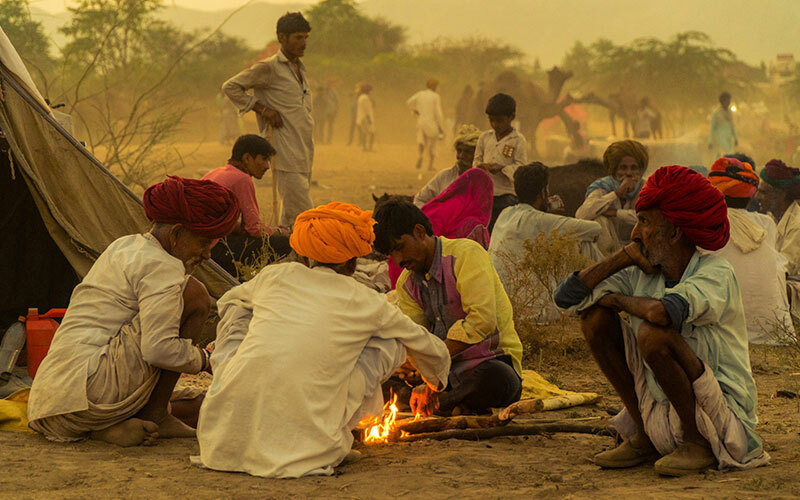 Optional: Early morning, one can have a jeep ride to the Bishnoi villages, where you will get an opportunity to see the local village people spending their morning in day to day activities. Here you can witness how people living happy in such scarcity of resources. If you are lucky enough, you can get to see the old man with the big turbans sitting and enjoying opium ceremony. After breakfast, proceed for the exciting city tour of Jodhpur visiting Mehrangarh Fort – the heart of Jodhpur, the largest among all the forts of India and the one whose beauty and magnificent view can never be described in words. The next attractive sight in Jodhpur is Jaswant Thada – a great architectural built up. Later take excursion tour to Osiyan Temple – the white marble of the temple adds to its beauty the most; it is 60 km away from Jodhpur. Overnight at the hotel. Morning, drive to Pushkar. Pushkar is the pious religious city of Hindus holding the only Brahma Temple in world. Upon arrival, check into the hotel. Later take sightseeing of the Brahma Temple and the Ghat. 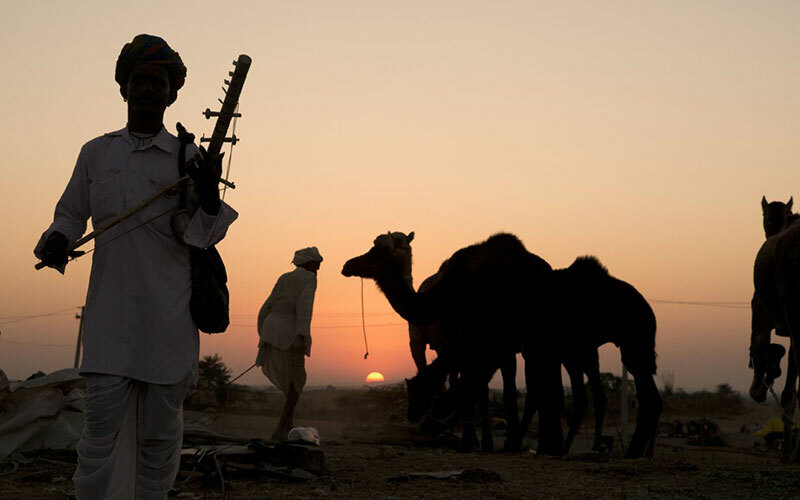 Pushkar is also famous for the colourful cattle fair which include all the variety of camels. Rest of the day is free to explore the local colourful market. Overnight is at the hotel in Pushkar. After breakfast drive to Jaipur, it is the capital city of Rajasthan and also known as Pink city. Upon arrival, check-in at the hotel. Jaipur is famous for its gems and jewellery other than the monuments and forts. Evening free to explore the market of Jaipur and shop for the souvenir of Rajasthan. Overnight is at the hotel in Jaipur. Morning after breakfast excursion to Amber Fort, enjoy and admire the beauty of the fort, while sitting on the elephant’s back. Places of interest at the Amber Fort is Diwaan-e-Aam where the kind used to meet the local people and Diwaan-e-Khaas, where he meet the friends and rulers of other states etc. Once here, one thing not to be missed is Sheesh Mahal (palace of mirrors), made by the king for his queen. The design in the palace is carved of pure glass. Afternoon, we visit City Palace, Hawa Mahal and Jantar Mantar. These all sights hold uniqueness in itself and are not to be missed out. Overnight is at the hotel in Jaipur. From here, we will visit to Agra, and on arrival, check into the hotel. After little refreshment, proceed with the guided sightseeing tour of Agra visiting Agra Fort - speaking the story of victory and successful rule of Mughals. Itimad-ud-Daulah architecturally great and important sight to be covered, also popularly known as ‘Baby Taj’. Overnight is at the hotel. Early morning visit the world famous loving monument called Taj Mahal at sunrise, the beauty of which will be more glorified with the rising sun. Here, we will ride at Tonga which will take us to the entry gate of the Taj Mahal. Spend time in Agra, one can’t stop itself to just sit and stare at the beautiful Taj Mahal. Return back to hotel for breakfast and after spending time at leisure, we will continue our drive to Delhi. On arrival, we check-in at the hotel for an overnight stay. Morning you will be transferred to the international airport to board flight for onward destination.